When arriving at or leaving the Sturgis Rally, the most interesting roads run through the Pine Ridge Indian Reservation. It's another aspect of the Sturgis Rally. 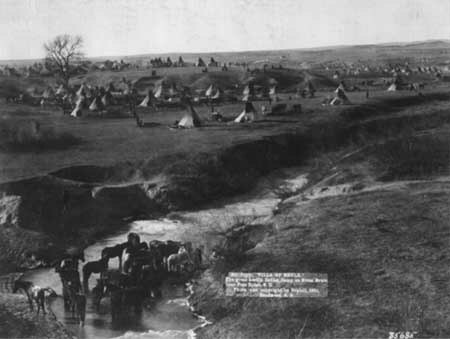 "Go back in time at the Sturgis Rally...and perhaps to another way of life at the Pine Ridge Indian Reservation..."
The photo below was taken in 1891 at a large camp of Lakota on the Brule River near Pine Ridge in South Dakota. You'll be biking through history at the Sturgis Rally. When the Sturgis Rally is over, at least over for you despite the fact that other fanatics are lying about the Harley strewn ground soaking up those last moments, you might leave in just too big of a hurry. Maybe you'll even end the Sturgis Rally by having Mr. Jeeves wheel the Harley onto the Lear jet. I don't know. But if you want to have a more interesting exit, consider your escape route. The one we're recommending is through the Pine Ridge Indian Reservation in southwestern South Dakota. It's the home of many Lakota. It's also one of the larger Indian reservations in the country, and a land of some fine scenery as well as a Lakota culture which some people find very interesting. "The rez," as locals call the reservation, is also economically depressed. So, maybe a little Sturgis Rally business wouldn't hurt. Our Sturgis Rally route of choice starts in Rapid City. You'll head down Hwy. 44. It's almost a straight shot into the Pine Ridge Indian Reservation. You'll also be in the close vicinity of Badlands National Park, perhaps the hottest spot between here and Hell during August. But still, a good place to visit. As you bike down rural Hwy 44 you'll be on an untouristed route through western South Dakota. The old highway goes along Rapid Creek and skirts part of the Buffalo Gap National Grasslands. You may see a few antelope or prairie dogs. The national grasslands are center of a fight about just how these publicly owned lands are to be managed - mainly for the few cattle grazers around them, or for wildlife, habitat and the entire public.